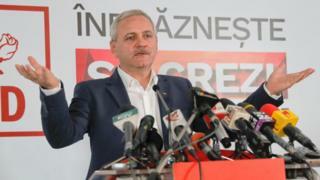 Romania's left looks set to return to power, exit polls from Sunday's parliamentary election suggest. The Social Democratic Party's (PSD) resurgence comes little more than a year after a corruption crackdown forced its last leader from power. Victor Ponta resigned after a deadly nightclub fire in October 2015, which became a platform for wider discontent. It appears to have won around 45% of the vote after standing on a promise to raise wages, the polls suggest. The PSD also promised increases in pensions and tax cuts. Its nearest rival, the centre-right National Liberal Party (PNL), is far behind on 20%, according to the polls. The promises, which were made on both sides, were popular among voters in one of the poorest countries in the European Union, with one in four living in poverty. But corruption was another priority - one which the new Save Romania Union party promised to tackle, giving them as much as 9.2% of the vote and third place, according to the polls. Party leader Nicusor Dan called the predictions "a victory for Romanian democracy", noting people had left their jobs to volunteer to set up the party, which was created in February. But while corruption is clearly a concern for voters, Romania's next prime minister could be the PSD's party leader Liviu Dragnea, who is currently serving a suspended sentence for electoral fraud, which legally bars him from office. He denies any wrongdoing. His predecessor, Mr Ponta, is the subject of a corruption inquiry - charges he also denies. Romania's current leader, Dacian Ciolos, an independent, took over as a caretaker in November 2015 after Mr Ponta stepped aside. Many Romanians saw the 2015 fire at Colectiv club in Bucharest, when 64 people died, as the tipping point. The tragedy prompted a nationwide attempt to clean the country up. The National Anti-Corruption Directorate, the agency responsible for the campaign, has made an impact over the past year, putting former government ministers, media moguls, judges and other powerful figures under investigation. Romanians have largely backed the call for the anti-corruption campaign to be a priority for the next government. The official results for the 504 seats which are being contested are expected on Monday morning, but Mr Dragnea has already said he is preparing to begin discussions to form a parliamentary majority with the ALDE, a small grouping which took about 6% of the vote. "Today's vote clearly indicates Romanians' choice for a future government," he said.